The owner of the Milestone property, between Kipling Street & Hoyt Street, just south of Alameda, has listed it for sale. 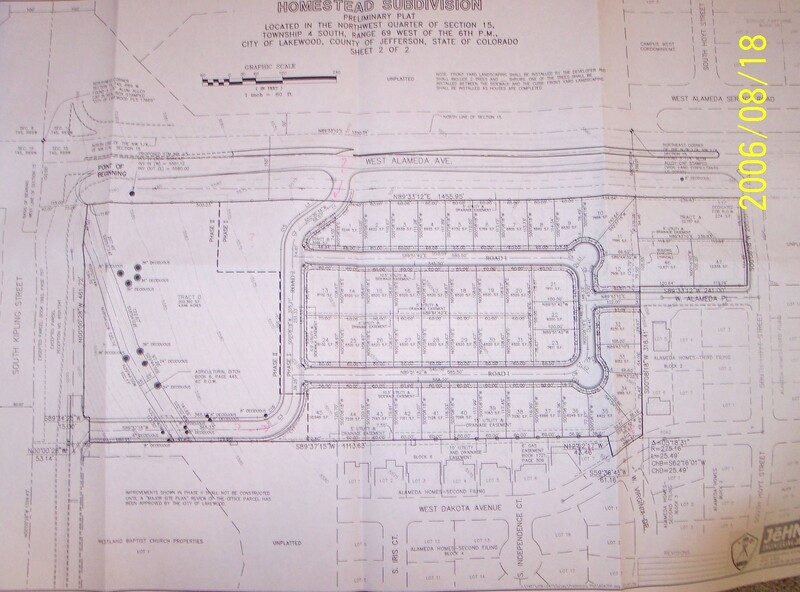 Plan 1 is the original design of the apartment complex on the parcel. Plan 4 was presented in January 2004. The Milestone property is currently pending sale to a new developer. What we know is that there is a pending contract to sell the property to Opus and Allegro. These developers are hoping to purchase the land, rezone it, and build a senior care facility. They also want to develop the 5 acre office-zoned parcel into retail space. At this time we are waiting for the next neighborhood meeting to be scheduled with the developers. We have asked that they consider a PD zoning of the property that will enable the zoning to apply only to this defined project. Otherwise, the zoning shall remain as is. Please plan to attend the next meeting to hear from the developers about their plans, learn more details, and have the opportunity to share your input. The date and time will be announced as soon as it is determined.